Bodies of the fighters have been exhumed from under the debris at the Donetsk Airport, which saw months of some of the most ruthless fighting in the Ukrainian conflict. 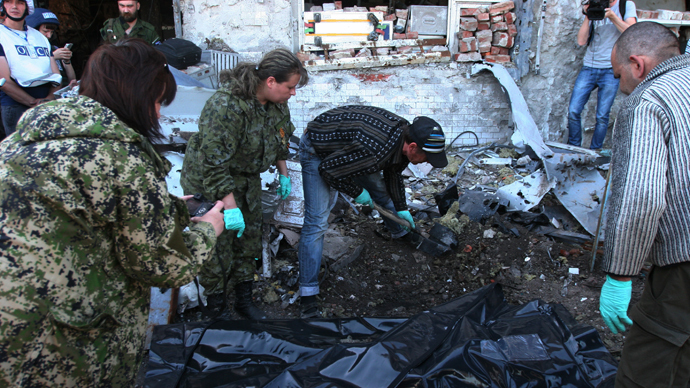 Regular truce violations make retrieving the remains an extremely risky mission. OSCE observers along with the Red Cross representatives visited the airport Friday to try to exhume the bodies of those who were killed in the fighting. Earlier this week, the OSCE admitted that ceasefire violations in the airport area have died down. Some of the bodies recovered at the airport have been under the rubble for months, as it's been too dangerous to remove them because of the constant shelling of the area. “The main thing for us is to ensure that people who were killed in the armed conflict are properly identified and returned to their families,” the Red Cross representative said. 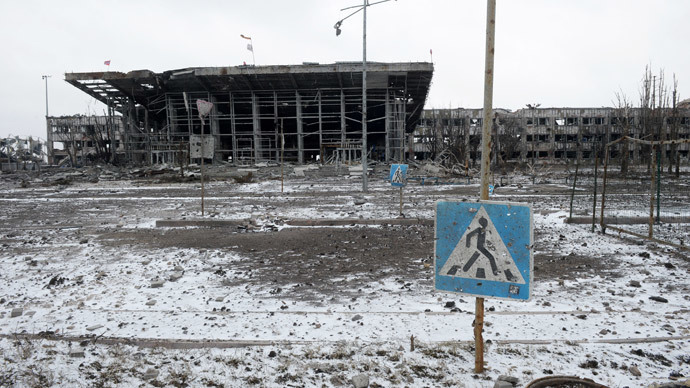 The OSCE and the Red Cross exhumed the remains of at least three soldiers at the old terminal of the Donetsk airport. The burned body parts mixed up with debris have been there for a long time and now hardly look like they ever belonged to a human being, reported RT’s Roman Kosarev, who witnessed the exhumation. The profoundly decomposed and incinerated human remains at the airport can only be identified with the help of genetic tests. Once the tests are completed, the relatives and loved ones of those who died fighting at the airport will be notified. The exact number of soldiers who have died in Donetsk airport is still unknown as more and more human remains are still being recovered. 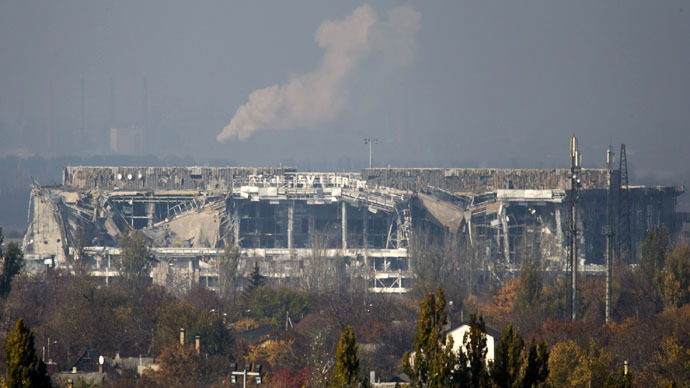 Shut down in May 2014 with the beginning of the active phase of the civil war in Ukraine, the $750 million Donetsk airport was reduced to rubble in nearly a year of fighting between the Ukrainian and the anti-government forces. 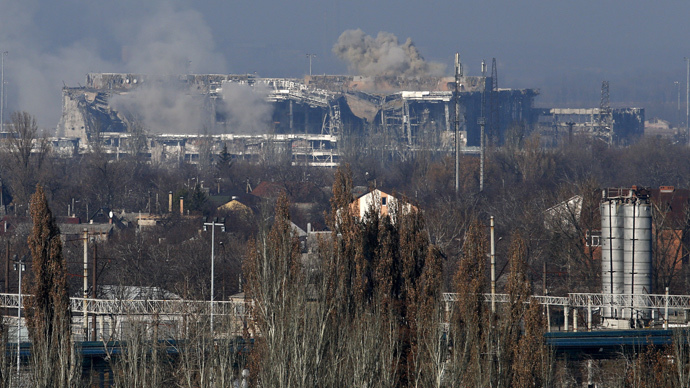 Despite strong resistance from Ukrainian servicemen dubbed “cyborgs,” the southeastern Ukraine militias gained control over the strategic Donetsk airport in mid-January. Although since the February Minsk peace accord was struck, the ceasefire has been generally observed in Eastern Ukraine, European monitors keep reporting violations on an almost daily basis. Artillery shells are regularly exploding in the city of Donetsk and also on the territory of what used to be the city’s airport. Ukrainian President Petro Poroshenko has recently vowed to reclaim the airport – and to fight to the last drop of blood. 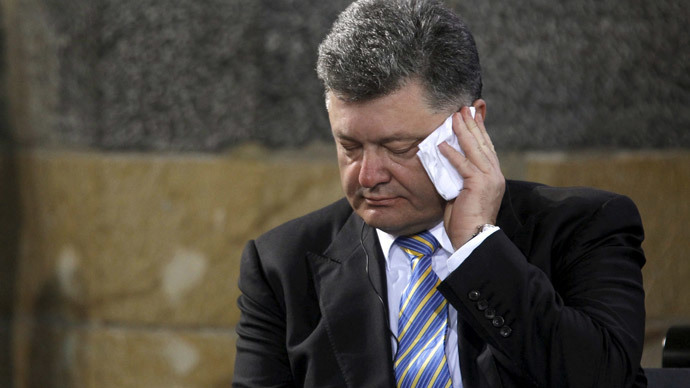 “I have no doubt we will free the airport because it is our land,” Poroshenko said. The statement led to fears that active fighting might resume at the airport, which has been regarded as the key strategic location by both sides and to this day it remains one of the most volatile zones of the conflict.